When Amazon began developing the Echo Smart Speaker, they decided to follow Apple's lead with their popular, humorous and spunky Virtual Assistant, Siri. 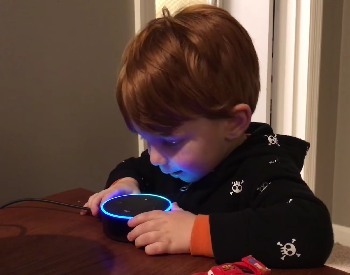 The aim was to not only add some fun to the new device, but to humanize Alexa’s speaking patterns, thus making her a more endearing or "warm fuzzy" addition to the household. ...would you like to go on a date?" ...how much do you weigh?" ...tell me a love story." ...when is the end of the world?" ...where do babies come from?" ...what are you going to do today?" ...give me a 'roses are red' poem." ...sing me a love song." ...pretend to be a supervillain." ...do you have Prince Albert in a can?" ...good morning (sometimes she gives- this day in history). ...ask Uber to get me a car." ...what's the Skill of the day?" ...where is the nearest florist?" ...set an alarm for 4:30pm." ...set the thermostat at 72 degrees." As the Alexa Echo is always on, monitoring ambient room sounds while waiting for the cue word "Alexa" to spring into action, you might just be wondering... is that little hockey puck spying on me? Amazon says it doesn’t collect any data until Alexa is asked a question or given a command. 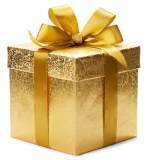 And then, the question or request is encrypted and securely sent to Amazon’s cloud servers. Where it is stored! 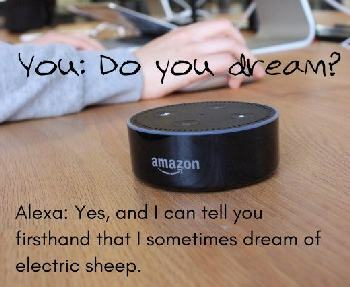 So, they say, the Echo would never record anything but your spoken queries and Alexa's responses. Sorry, we just don't beleive that Smart Speakers are being used as some secret weapon for the government or corporate America to spy on us. Of course not. We think the stories about Smart Speakers' ability spy on us have been greatly exaggerated. We pay our bills online, surf the 'net at will, and make phone calls daily. Those activities probably put us at more risk for invasion of privacy than these useful little speakers in our home. We've decided to take the slight risk and avail ourselves of the convenience of modern electronic communications anyway. More and more business, banking and recreational activity takes place in the cloud; so we feel we are just "going with the flow". And in the future, you likely won't have a choice. Regardless of how we feel, this is a decision you must make for yourself. If you’re paranoid about governments, hackers, or corporations spying on you, then forget about having an Echo in your home. It would just cause you high anxiety. 1. Delete the Data. You can delete voice recordings you have made. On the Alexa app > Settings (upper L corner) > Settings > History (near bottom of page) > Tap on desired recording > Delete Voice Recordings. In your Amazon Account online > Accounts & Lists Tab > Your Content & Devices > Your Devices Tab > Echo Dot > Manage Voice Recordings > (Read Warnings) > Delete. 2. Mute the Mic. The Echo has a mute button on the top (microphone with a slash through it). Use it whenever you want to have a private conversation. But don't forget to turn it back on! Keeping the mic turned off defeats the whole purpose of having a Virtual Assistant, ready to spring into action merely by voice prompts. Back to Alexa Echo page. Smart Home devices that work well with Alexa. Haven't decided yet? Read this: Google Home vs Alexa Echo.